Take a drive up I-5 and you will soon be experiencing the luxury and tranquility that Tachi Palace Casino & Hotel has to offer. The Tachi Palace Casino & Hotel is located in Lemoore, CA situated in the heart of the Central California’s San Joaquin Valley. Our casino is the ideal getaway from the hustle and bustle of life in Los Angeles. Leave life behind and treat yourself to all the amenities that Tachi Palace has to offer! Tachi Palace Casino boasts two equally lively casinos with over 2000 gaming machines! Looking for a room full of vibrancy and delight? Look no further than our Casino of the Sun. Modeled after the sun; this casino is full of bright colors which only enhance your gaming experience. For those looking for a more laid-back and relaxing atmosphere, check out our Casino of the Moon. Drawing colors and atmospheric elements of the moon, the Casino of the Moon offers gamers an ambiance that encourages relaxation while still being fun. 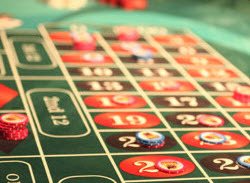 Tachi also offers table games like blackjack and roulette. Is poker your game? Check out our spacious 7-table poker room. There’s so much to experience at Tachi you can’t do it all in just one day, so make a weekend of it! Make a reservation at our luxurious hotel and treat yourself to a specious room with high-thread count sheets and an evening turn-down service. It’s just like being home in Los Angeles only better! For those looking for extra space with a view we offer beautiful loft suites. Don’t forget your swimsuit, our grand pool is a refreshing way to start or end your day. While enjoying the many amenities of our hotel, stop by our full service spa and pamper yourself with one of our spa packages. From body treatments, to massage and nails the possibilities are endless! Tachi Palace Hotel & Casino has something for everyone, whether you’re a gamer or just into pampering yourself we have it all! Let Tachi Palace Hotel & Casino be your escape from the L.A. life.